A little background: This office is the above-garage room in our house. 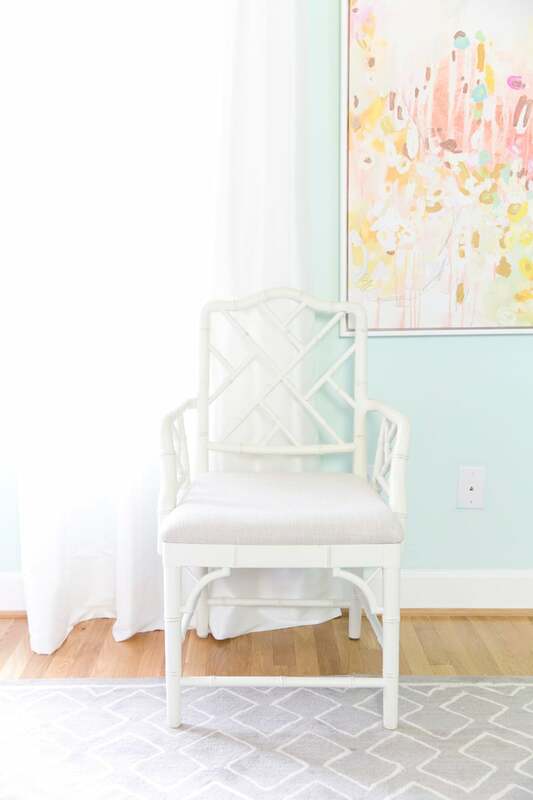 When my husband and I moved in several years ago, it instantly became a “throw everything in and figure it out later” room. Anyone else have one of those? We were getting married a month later, and I was starting the book shoot for Frostings immediately after that so there was no time to organize a legit office. Fast forward a few years (add a baby in the mix) and it still looked like a mess. 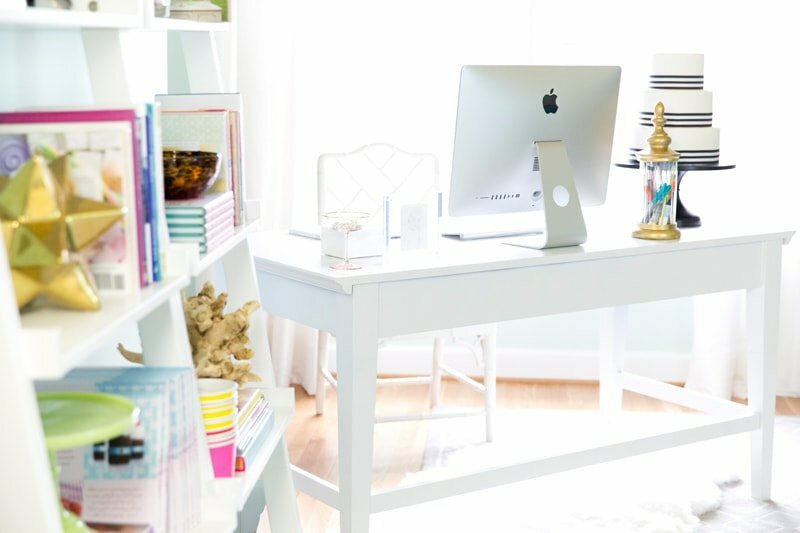 Though I love a messy creative area (sometimes you gotta get messy when designing), my organized, Type-A loving brain needed an orderly blog office. Despite what it may seem, about 90% of my job is spent on the computer. 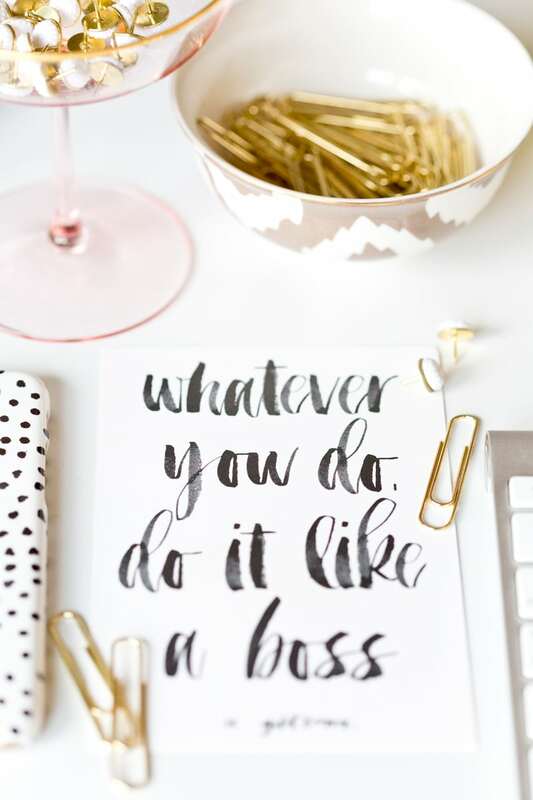 From brainstorming with clients, accounting/taxes, uploading and editing photos, writing posts, handling back-end website things….all at the computer! With my blog growing into a full-time styling/writing career, I knew it was time I put a focus on creating an intentional space for this work. Inspiration: I told Mallory all my thoughts and ideas from loving black and white stripes to wanting touches of gold throughout. I also wanted a few spaces for my daughter Blakely to play and craft when she “works with Mommy”. I also wanted to stay on a budget and reuse/DIY as much as possible. For example, I spray painted my black desk white and love how it turned out! 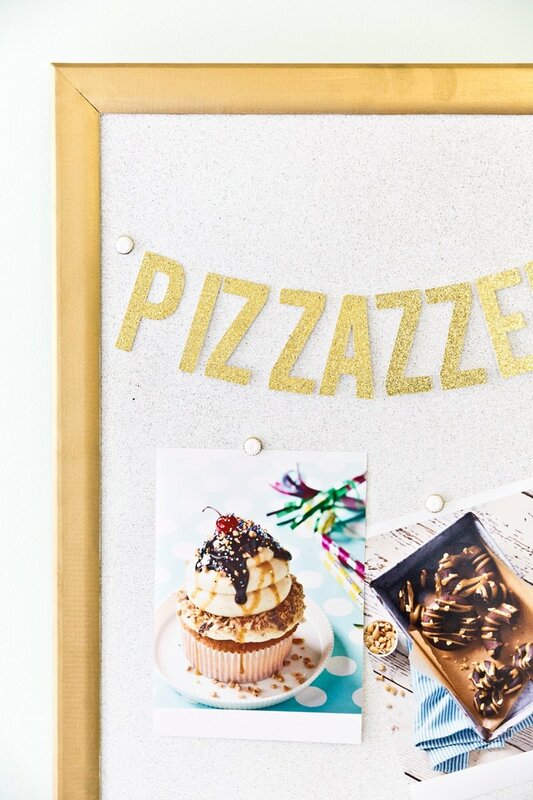 You’ll also spot an amazing gold rimmed cork board that Mallory created to hold notes, inspiration clippings, calendars, etc. Adore! 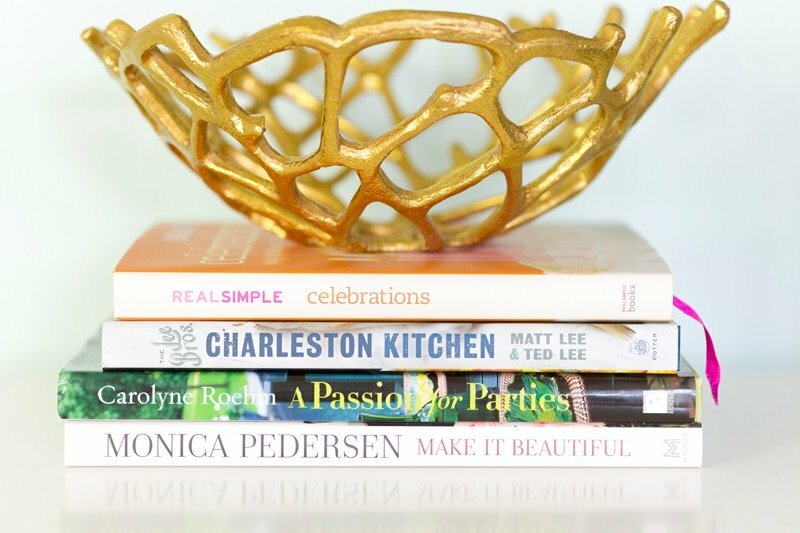 After the photos, I’ve listed out details on some of my favorite elements (and a source list)! There were maybe a billion photos so at risk of making this the longest post imaginable, I tried to pick my faves. Forgive me though, it’s still a long one! I’m just SO in love with my office now! Oh, the horrific before photos are at the end too! Eek! 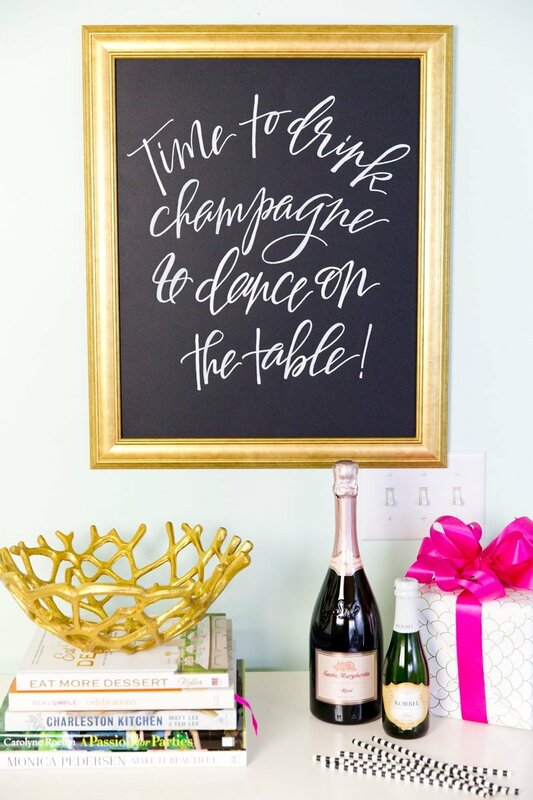 I love calligraphy so we asked Elizabeth Hardin of HardInk Calligraphy to create this amazing print: “Time to drink champagne and dance on the table!” in white on black and framed in gold. I adore how it turned out! Pretty sure it would also be amazing as a stationery card. Elizabeth? Hear this? Haha! 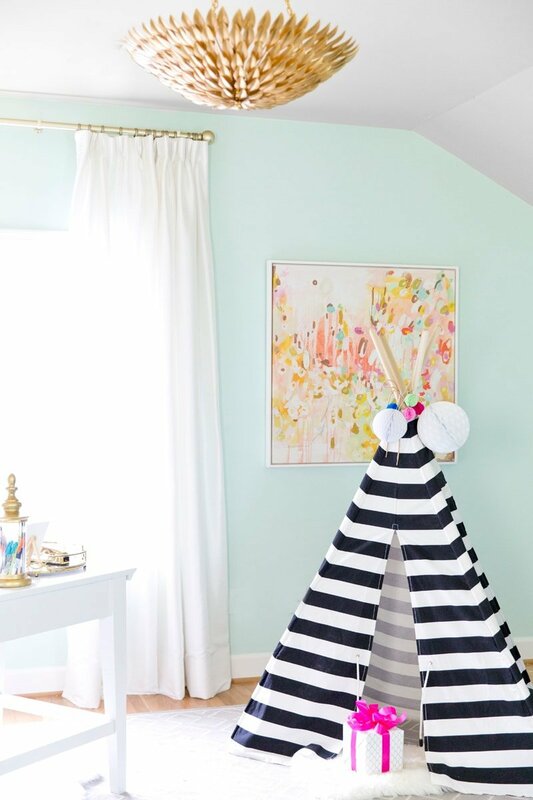 It’s no surprise that I love black and white stripes so a fun teepee space for Blakely was a no brainer. Mallory even found the cutest mini sheepskin rug from Ikea to go inside. It matches the one under my desk. So soft and so cute! She loves it. She also loves the mini table and chairs! 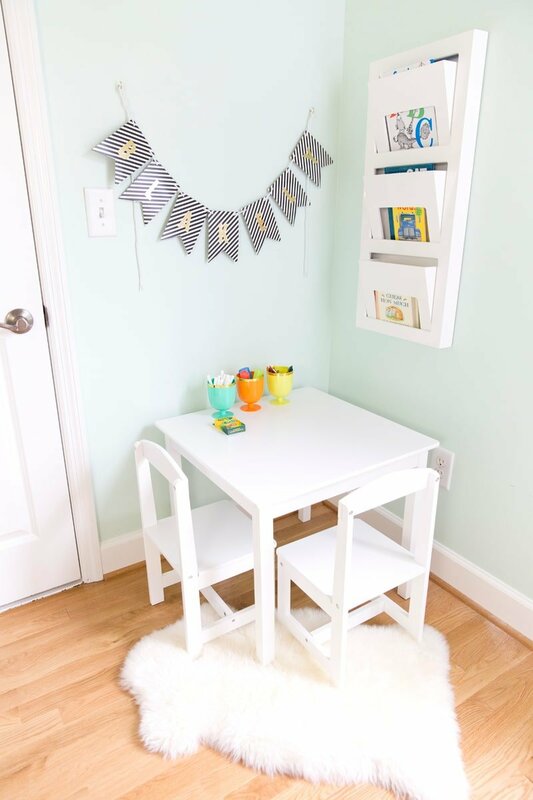 Colorful crayons, chalk, and other craft supplies are ready and waiting in fun cups, a personalized striped banner with her name on it and a bookshelf for kids’ books are nearby. Her space is so fabulous! I love that she has an area to craft and create with me! Mallory DIY’d the best cork board. First of all, it’s HUGE which is exactly what I wanted. 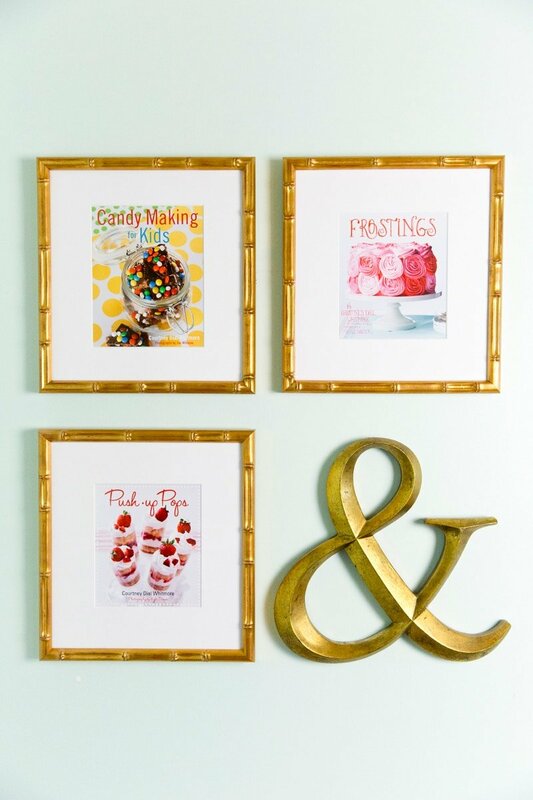 I can pin up clippings, art prints, calendars, you name it! Plus, it’s white and trimmed in gorgeous gold. She’s going to post the DIY later this week so be sure to follow her blog for that post! I love displaying fancy glassware but sometimes it doesn’t really have a place in an office. 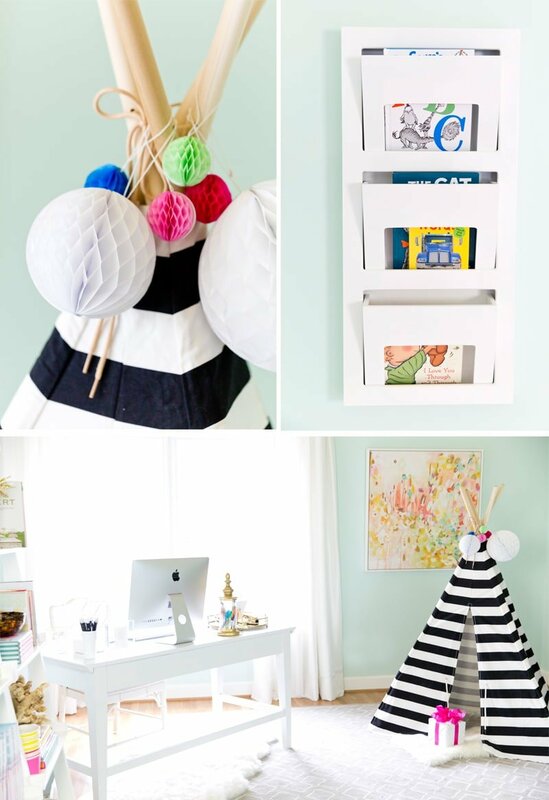 You might spot gold and white push pins sitting in a pretty pink bauble on my desk. Love this! My book covers were framed in the “before office”, but it got a bit of a makeover with the help of Framebridge (my obsession, seriously). You can even have them frame your Instagram pictures all through their app. Best gift idea. Obsessed. 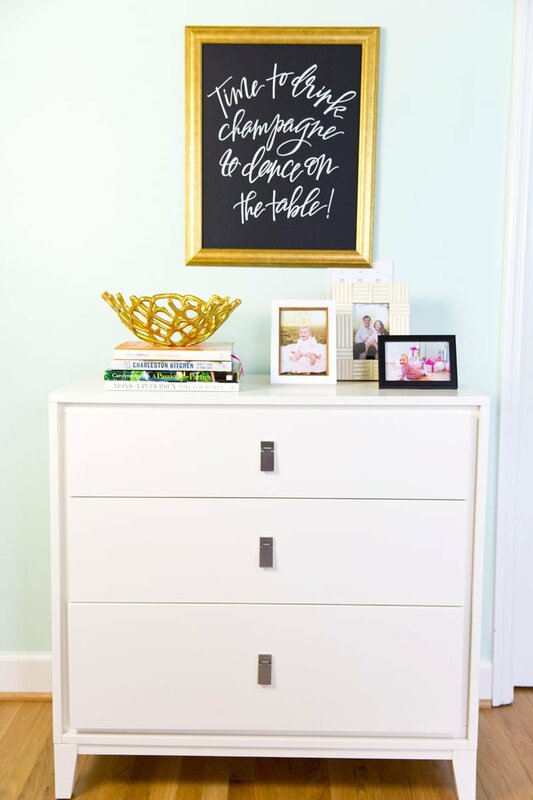 This might be one of my favorite parts of the room! A couple of years ago, I purchased a French bottle drying rack. 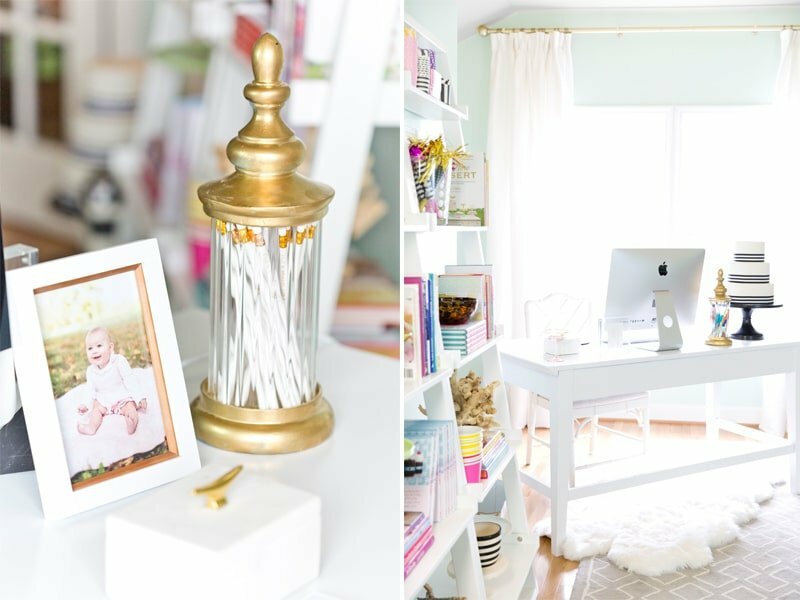 For this office redo, I sprayed it gold and ta-da! 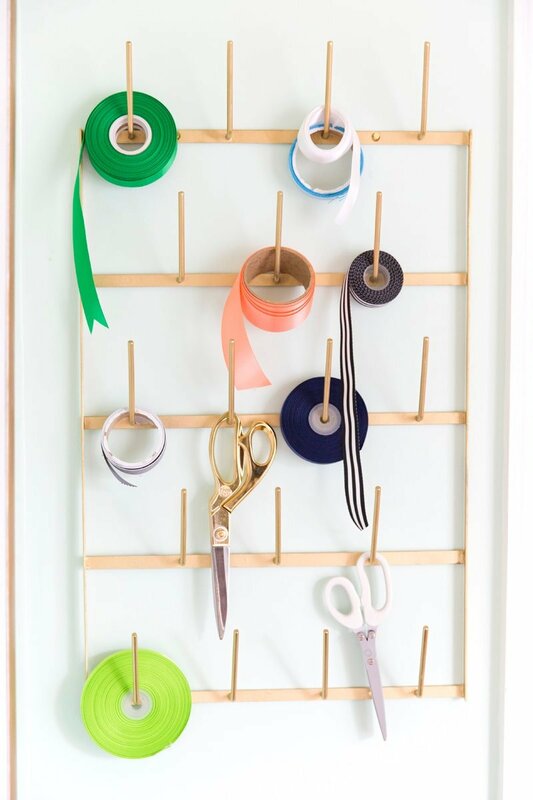 It holds ribbon spools, scissors, anything that can hang basically! I gave Mallory the difficult task of hiding all those ugly modems and cords at the bottom of the white leaning shelves. I love the basket and it keeps them all tucked away nicely! It instantly put my clean-loving mind at ease! These are the actual photos I sent to Mallory when I first reached out to her. It literally looks like something out of Hoarders. This is what a new house, wedding, dog, 3 books, and a baby will do to you. Talk about a transformation, huh? Where did all the props go? A prop room, stay tuned for that reveal! Many of the props did stay here, however, because I have a small walk in attic off this room that holds a tall shelving unit. Secret storage for the win! And the after! I’m so much happier to have a nice work space. 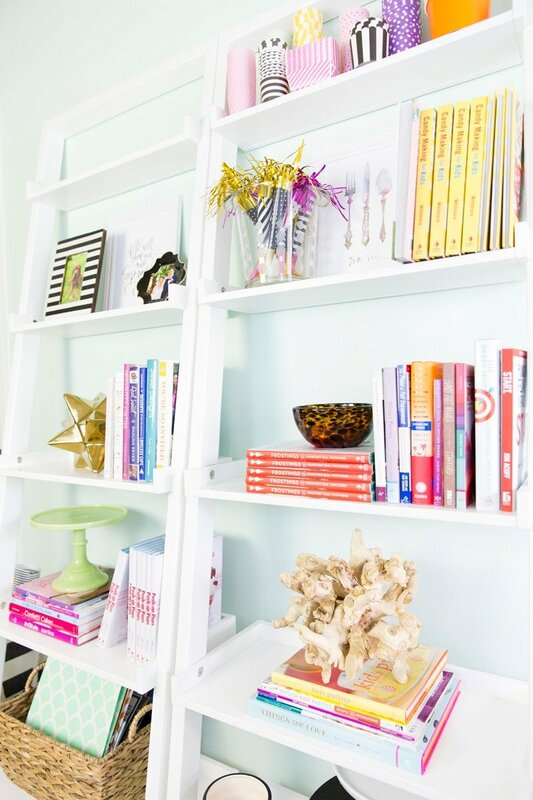 It does wonders for the creative mind to feel organized yet still surrounded by lots of bright light and color! If you don’t see a source listed, please leave a comment! Yep. Just as gorgeous as I thought it would be. Love it, Courtney! So sweet, Stacy! THANK YOU! what a beautiful space! and i love that there’s little spots for your daughter! Thank you!! Yes, I hope she loves to be creative too! Maybe I have a future little blogger, haha! Looks awesome! Thanks for sharing the photos & all your sources! oh my gosh, I would LIVE in that tent if it ment I could use that office! It turned out awesome.. pinning for inspiration! Haha! Thank you so much for the sweet comment! The tent is definitely one of my favorite parts! 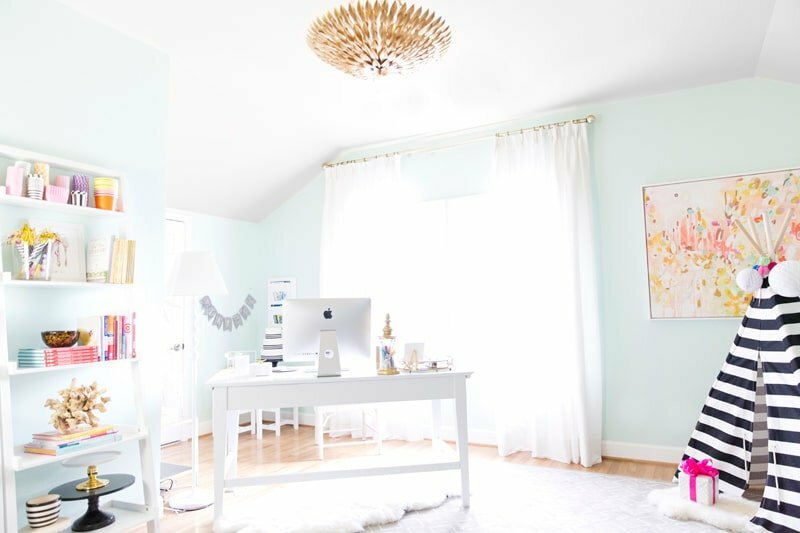 What a beautiful office space, Courtney! 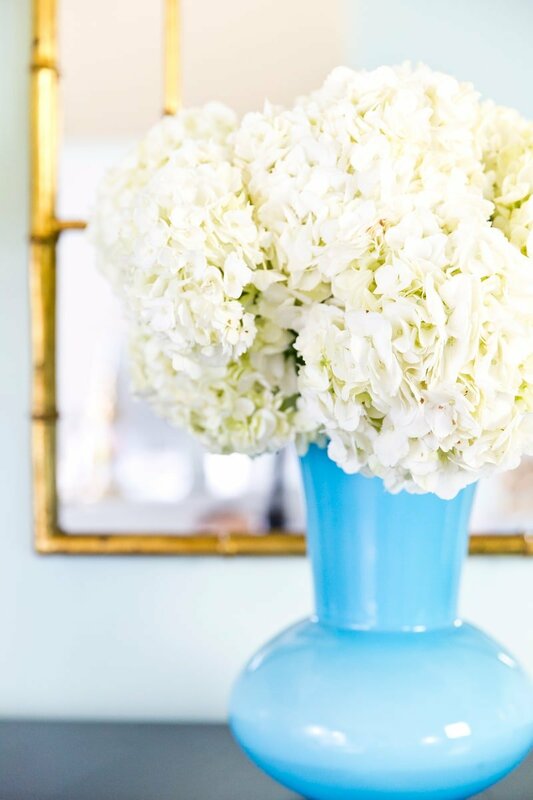 So bright, cheerful and inviting! My office is a shade darker than that, but still has the gold and black accents as well. Great minds think alike!! Can I ask if that chest from West Elm can be used as a file cabinet? I *think* it could? The drawers are deep and wide! I have tons of stuff in each one!! Very pretty! Love the color choices. Curious what you chose for storage. 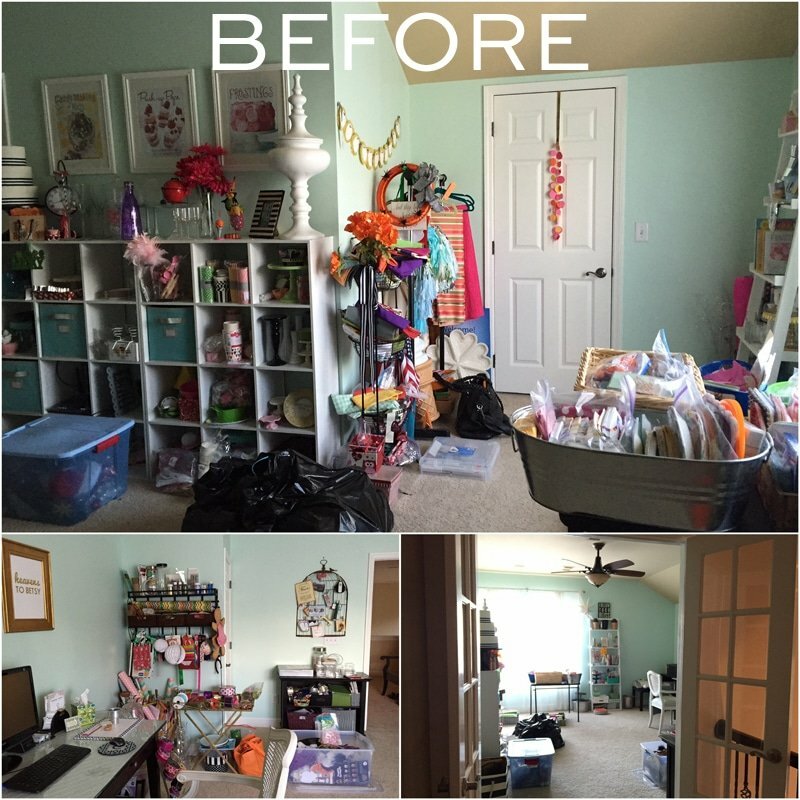 In your before photos, you had a lot of stuff even in big plastic bins. Hi Sherry! A lot of it was condensed into a small walk-in attic space but MOST went to a separate prop room which I’ll be posting a tour of next week! :) As my business grew, I realized I had to get props all together in their own happy little space. Stay tuned! Beautiful office! Love your screen saver. Did you design it yourself? Yes, Cyd! PLEASE come hang out STAT! :) Thank you for the sweet note! Absolutely gorgeous! 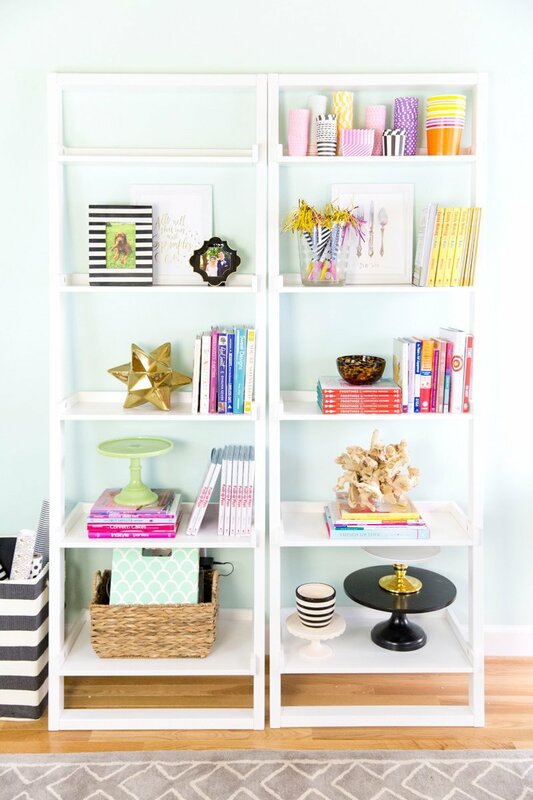 Makes me want to clean up my space and organize! So gorgeous! 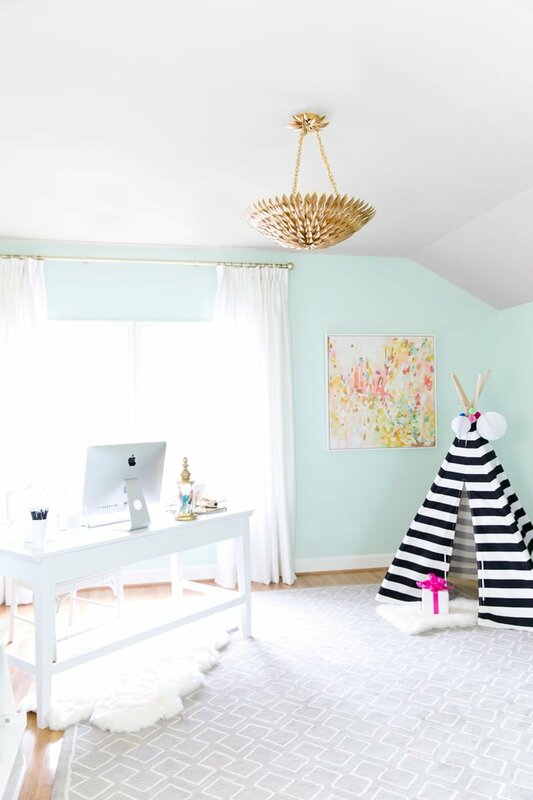 I just want to know one thing…If I ever come to Nashville, can I come and play in that teepee? ;) Love it all! What a beautiful workspace! 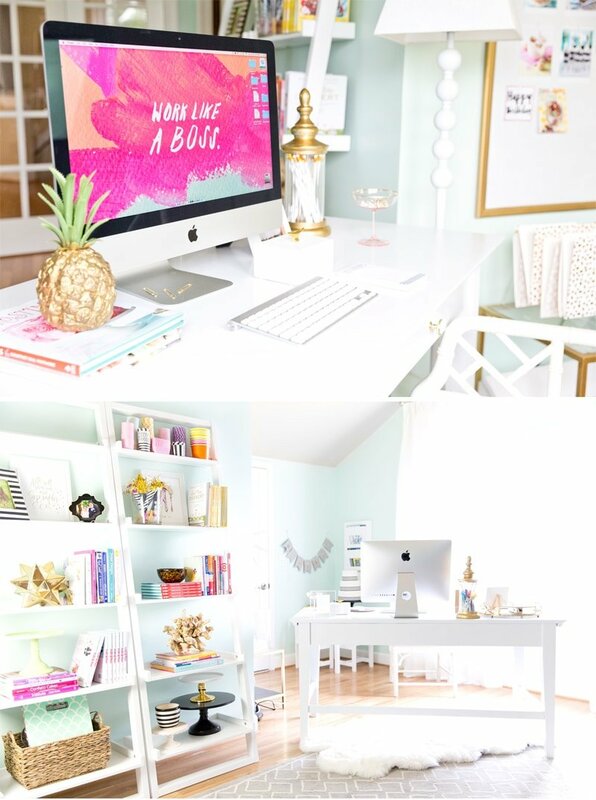 It’s basically my dream office haha, I love how light and bright it feels with the blue walls and colourful accents. You’ve really outdone yourself with the decor, I wish you could come and create the perfect desk for me too! Bookmarking on my phone for inspiration when I’m out shopping. 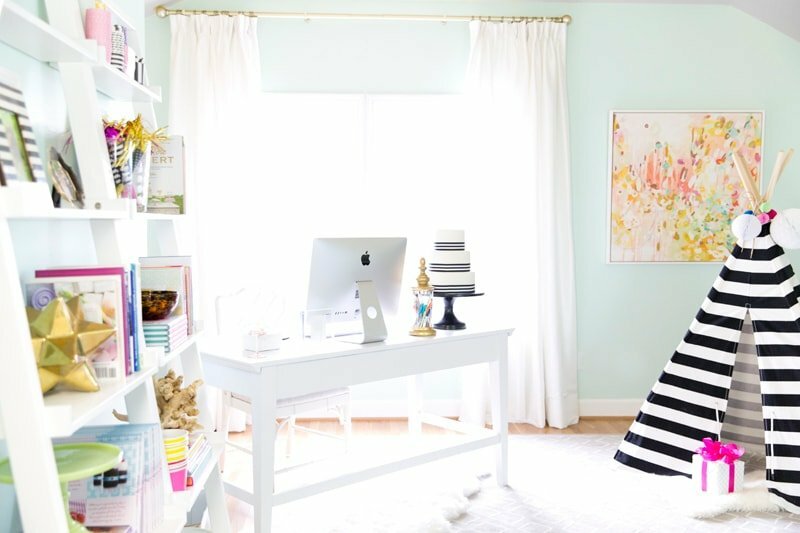 Thank you for giving me hope that my home office can turn from disaster to WOW! So beautiful! This is really a good blog and I just want to share this with all my friends so thanks for this amazing blog. I know this is old, but I love everything about this office! Also, do you remember where the gold pencil holder is from? It’s so cute!